Robot love is so sweet. This little bride and groom are getting married. 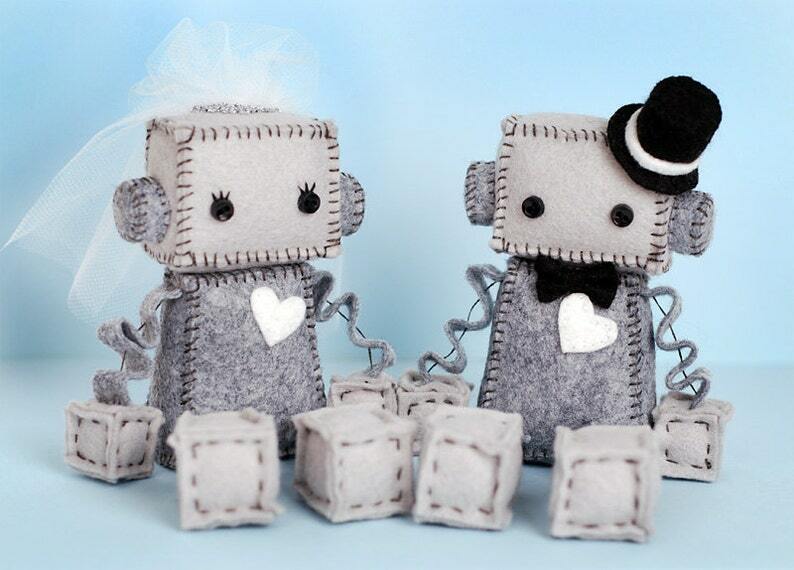 They would make the cutest wedding decorations or gift for the couple that loves all things geek. Robots are about 4 inches tall sitting (without top hat or veil). They are made of premium wool felt, cotton embroidery floss, fine netting and little plastic buttons for eyes. The bride is wearing a white veil with silver French knot accents in a tiara type shape. The groom is wearing a top hat and bow tie. They have matching white felt hearts. Please note that the veil is very white, the photographs appear a little yellow. Robots are all handmade by me and one of a kind so expect slight differences. Arms and legs are not poseable. Robots do not stand by themselves.